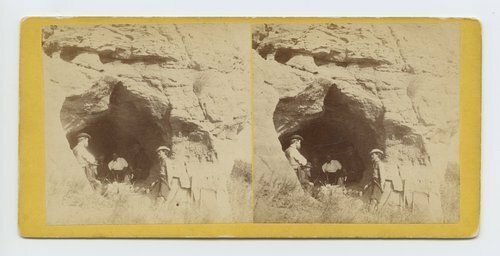 This stereograph shows several men having a picnic at Indian Cave on Mulberry Creek, Ellsworth County, Kansas. The photo was taken eleven miles northeast of Fort Harker and 494 miles west of St. Louis, Missouri. Fort Harker was located in present day Kanopolis, Kansas. It is from Alexander Gardner's series, Across the Continent on the Union Pacific Railway, Eastern Division.